Fourth grade is ground zero in the fierce debates about education reform in America. It’s when kids (well, some of them) make the shift from “learning to read” to “reading to learn,” and volumes have been written about fourth grade by educators, administrators, philosophers, and pundits. 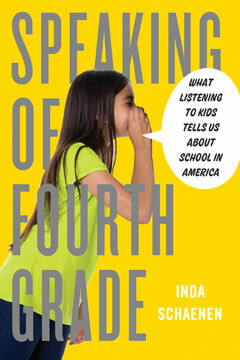 Now, in this fascinating and groundbreaking book, Inda Schaenen adds the voices of actual fourth-grade kids to the conversation. Schaenen, a journalist turned educator, spent a year traveling across the state of Missouri, the geographical and emblematic heart of the country, visiting fourth-grade classrooms of every ilk: public, private, urban, rural, religious, charter. This journey gave her the chance to see how different approaches to education stack up against each other, to chronicle what kids themselves—a remarkably diverse set of them—have to say about all-important questions such as “What Makes a Good Teacher” and “What Makes a Good Student” and to learn exactly what they think about conflicts, friendships, and the very purpose of school in the first place. Drawing on the children’s candor, Speaking of Fourth Grade elevates their collective insight into a range of hot-button issues, including STEM initiatives, standardized curricula, reading for rewards, bullying, high-stakes testing, and how (and why) highly privileged kids are taught to think while underprivileged kids are taught to sit still and behave. These youthful perspectives are punctuated by Schaenen’s exquisite gift for elucidating the educational zeitgeist of our time. The result is a 360-degree view of what going to school in twenty-first-century America is really like. The honest, revealing, and at times amusing voices of the children in Speaking of Fourth Grade will stay with readers—parents, teachers, and others—for many years to come. Publishers Weekly calls Speaking of Fourth Grade "an outlet for voices often overlooked in the debate about education in America."